According to Canons 107 and 108, divine law decrees that there is a noted distinction between the laity and the clergy. This distinction is marked by entrance into the clerical state. That entrance ensures on the "calling" of a candidate to the priesthood by a lawful bishop in communion with the Roman Pontiff whose "seminary has been erected by order of and with the approval of the Holy See". The rite of tonsure is just that - a rite. It is not an order so does not involve the use of orders to convey. Rev. 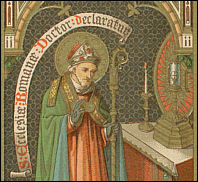 Charles Augustine, in his Canon Law commentary states that tonsure is clearly a jurisdictional act that stems entirely from jurisdictional faculties of the bishop. A bishop who never received such jurisdiction cannot exercise it to confer tonsure. Without tonsure, a man cannot become a cleric and only clerics are able to be ordained, (Canons 108, 118): only priests can become pastors and obtain an office, (Cans. 154, 453). 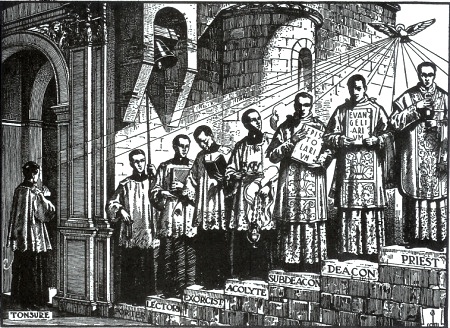 There are no "Traditionalists" [Note: enemies of the True Papacy in exile] who today can claim canonical mission jurisdiction by special faculties or from a Pope Pius XII bishop; so all these purported bishops UNDENIABLY lack jurisdiction, which can come to them through the Roman Pontiff, (Pope Pius XII's "Mystici Corporis" and "Ad Sinarum Gentum"). The Traditional Movement is priestless - Wow! I have never gone to a Mass - Help! Both the Vatican 2 antipopes and the "traditionalist" movement assail the divine institution of the Papacy. I didn't realise this until now. you are right. Thank you so much for bringing this to our attention. this issue of the tonsure.